Get off the couch and give it the spruce up it calls for with this problem-solution guide. Just like the fabric in clothing, upholstery gets assaulted daily by skin oils, hair, dust, food crumbs, and spills. If your chairs and sofas are starting to look worse for the wear, save yourself hundreds of dollars and don’t call in a pro—not yet, anyway. Banishing dirt, stains, even discoloration yourself can cost mere pennies. 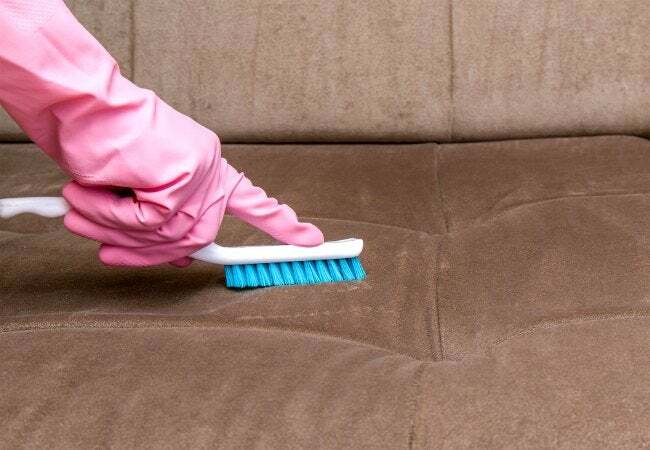 But before you dive into this guide on how to clean upholstery, first learn what you’re dealing with by checking the label on the bottom of the piece or under a cushion to see what type of cleaner is recommended. The label should have a code: W = Water Based, S = Solvent Based, WS = Water or Solvent. X = Professional Cleaning Required. Then use the cleaning tips and techniques here (making sure to test on an inconspicuous area first). If you do a general upholstery upkeep as part of your routine home maintenance, your furniture will look great longer. Give the piece a thorough vacuuming using the upholstery attachment. Start at the top, and work your way down, using short, left-to-right strokes. Working in the same direction is important, especially for fabrics that have a nap, like corduroy, chenille, or suede. Switch to the crevice attachment to better clean seams and folds, as well as around buttons and tufting. Or, employ a can of compressed air (just as when cleaning your computer keyboard) to dislodge dirt and dust from nooks and crannies. For fabrics with a W or WS code, mix a few drops of liquid dish detergent in a bucket of lukewarm water. Gently brush over the entire piece with a soft bristled brush, making it lightly and evenly damp with the soap solution. Be careful not to soak any areas, as excess moisture can cause some fabrics to discolor. Follow up by wiping the entire piece with a clean, damp cloth. Allow the piece to air dry completely before sitting on it. Don’t try to speed things up with a hair dryer, as the heat could cause fabrics to shrink or pucker, but feel free to turn on fans to amp up the air circulation in the room. Clean one side of any cushions and allow to dry completely overnight before cleaning the other side. For fabrics with an S code, use only solvent-based cleaners such as a dry cleaning solvent; water based cleaners can damage these fabrics. Dry cleaning solvent can be purchased online (type “upholstery safe dry cleaning solvent” into a search engine), or you may find it in home dry cleaning kits like DRYEL, available at a grocery store or at big box discount stores. Make sure your work area is well ventilated. Apply dry cleaning solvent to a clean towel and gently brush over generally dirty areas of upholstery. You can work solvent into heavily soiled areas with a clean, soft-bristled brush. Allow the piece to dry completely before sitting on it again. The quicker you attend to a spill (of wine, sauce, greasy food), the less likely it will stain, so as soon as your able, blot—don’t rub!—immediately with a clean, white cloth. To treat whatever mark remains, or go after spills that have set into stains, try a spot cleaner or dry cleaning solvent approved for your type of upholstery. If your fabric is water safe, wet and wring out a clean cloth or sponge and dip it into a mixture of water and a little liquid dish soap. Then gently blot the stain. Follow-up by blotting with a clean cloth or sponge that has been dipped in clean water, and wrung out. Repeat as necessary, and then blot the spot dry with a clean cloth or white paper towels. If the spot does not come out after two or three applications, it’s time to call a professional. “Browning” can occur when natural fabrics get overly wet or dry too slowly. 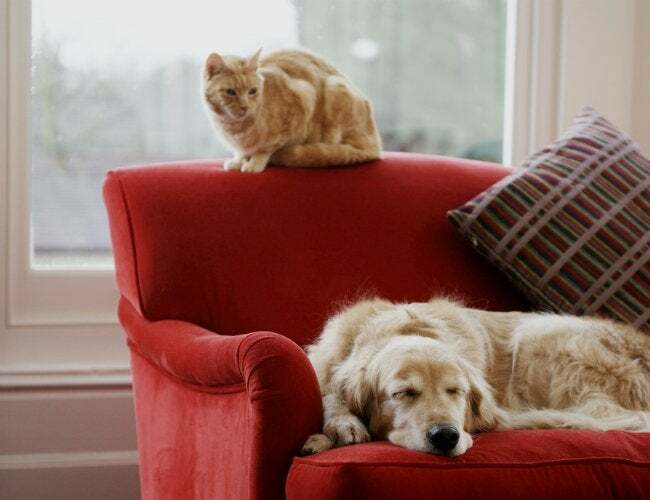 To counteract, use a neutral pH-based, fast-drying upholstery shampoo. Thoroughly vacuum the furniture first. Then, mix the cleaning product in a bucket of water according to the manufacturer’s instructions. (Tip: Use a hand-held egg beater or electric mixer to whip it up into a foam.) When there’s very little water left in the bottom of the bucket, the shampoo is ready to apply. Fold a clean, white, absorbent towel, dip it into the foam, and wring all of the moisture out. Wipe the entire piece of fabric in overlapping strokes, either vertically or horizontally—just make sure to stay in one direction. Apply more foam to the towel as needed. Allow the foam to sit for at least five but no more than 10 minutes. Remove the foam with a clean towel that’s been moistened in clean water and wrung dry. Rinse and wring the towel out as needed. Dry the piece quickly by opening the windows and moving the air in the room with fans. Do not use a hair dryer or anything that would apply heat to the area. The fabric, overall, needs to dry at the same rate. • With any of these techniques, be sure to test an inconspicuous area first (like under a cushion, or on the back side of the skirt) to make sure colors won’t bleed or fade. • Be sure to avoid getting water or cleaning agents on the wood or metal portions of your furniture, as this could rust, corrode, or cause discoloration. • These techniques should be used on natural or synthetic woven fabrics. Find out about cleaning leather here. • If your fabric has an X code, call a professional to clean your upholstery. 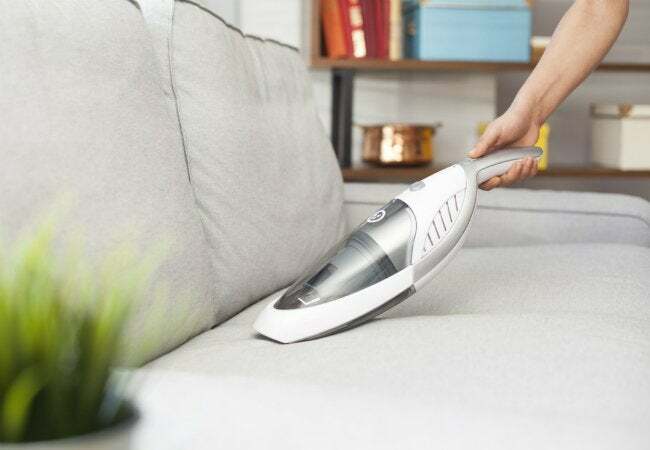 These services are generally provided in your home, a professional cleaner should be able to give you a general estimate based on the size of furniture and type of fabric that you have.